Janine Philips was born in Poland in 1929. She owned a illegal radio and she used this to chronicle the Second World War in her diary. 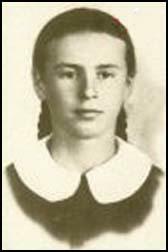 In 1940 Janine moved to Warsaw to complete her education. Janine took the Warsaw Uprising that was crushed by the German Army in October 1944. She was captured and taken to Nazi Germany as a prisoner of war. Liberated by the Allies at the end of the war, Janine moved to London where she became a chemist, married and had a family. In 1965 Janine visited Poland. While there an aunt handed her a book that contained her wartime diary. On her return to England she translated it into English and it was published as My Secret Diary in 1982. Hitler has invaded Poland. We heard the bad news on the wireless a few minutes after spotting two aeroplanes circling round each other. Just before breakfast about ten minutes to ten, I was returning from the privy when I heard aeroplanes in the sky. I thought it was manoeuvres. Then heard some machine-guns and then everyone came out from the house to see what was happening. Grandpa said, "My God! It's war!" and rushed indoors to switch on the wireless. The grave news came in a special announcement that German forces have crossed the Polish border and our soldiers are defending our country. Everybody was stunned. With ears glued to the loudspeaker we were trying to catch the fading words. The battery or accumulator, or both, were packing up. When we could no longer hear a whisper from the wireless set, Grandpa turned the switch off and looked at our anguished faces. He knelt in front of the picture of Jesus Christ and started to pray aloud. We repeated after Grandpa, "Our Father who art in heaven, hallowed be thy name." Soon after tea, Uncle Tadeusz, my new Aunt Aniela and Papa arrived from Warsaw with some more bad news. Papa said that we were not going back to Warsaw because it was safer to stay here, in the village. He arranged for a wagon to bring our winter clothes and other belongings. I wondered what will happen to our school, but Mama said that when a country is fighting for its survival, there is no time for schooling. All evening Papa has been trying to get the wireless going but did not succeed. Tomorrow, he'll try to get to Warsaw and see what can be done about the set which is so vital to us just now. Please, dear God, let our brave soldiers beat the nasty Germans. We are overwhelmed with sorrow. Polish resistance has collapsed. The Russians and Germans have met near Brest Litovsk. Warsaw is on its last legs. Papa said that they are short of ammunition and food. The German propaganda is pouring in from every wavelength. Papa's been trying to get the BBC on his secret wireless set which is somewhere in the attic. Papa often goes up there with Aunt Aniela. He fiddles with the knobs and she takes everything down. Then Tadek and Wojtek distribute the news around the village. This afternoon. Father Jakob called to see how we are getting on. Grandpa was full of indignation about God allowing such injustice to prevail on Polish soil. Father Jakob had to stop Grandpa before he said something terrible. When Grandpa gets going and when he's het up no-one is safe, not even God. Having soothed Grandpa's nerves. Father Jakob said that we, the children of God, are not here to question His wisdom but to pray for help and peace. Grandpa said that's exactly what he's been doing and a lot of good it did. Father Jakob replied that God has been awfully busy lately with everybody praying at the same time. Grandpa nodded and agreed that it must be sheer hell in Heaven, just now. Great-Uncle Emil came to see Grandpa to discuss the matter of guns and other weapons in the village. Grandpa suggested hiding them under the hay in the barn. But Uncle Tadeusz pointed out that it was the first place the Germans would search. He said the safest place for all weapons was underground. Later in the morning, Great-uncle Emil and Anton brought in at least a dozen different guns and buried them somewhere in the garden. I only hope Uncle Tadeusz can remember what is buried where. Our capital is on fire. At night we can see the sky stained with smoke and flame. The guns have died down. German troops have surrounded Warsaw almost completely. Papa says it's only a matter of days. We feel thoroughly dejected, forsaken by justice. Why, oh why, are the Nazis winning the war? Nothing but bad news. People are prepared for the worst to happen. A convoy of German troops on the main road to Warsaw has been reported by one villager. Grandpa is in a state of continuous anxiety. Mama is worried about his health. She's been brewing a herbal potion for his nerves. The odour of valerian pervaded the whole house and Papa said that anyone who can survive its wicked smell can survive anything. Mama made the brew in a jug and insisted that Grandpa should drink the lot. The effect was indisputable. Grandpa was flat out for the rest of the day. Mama got worried and wondered whether she'd cured him too much, and wanted to call the doctor. But Uncle Tadeusz said that, before getting better, it was quite natural for anyone to pass through a bad patch. Mama was not at all convinced, but she agreed that, at least. Grandpa's nerves were having a rest. After several hours. Grandpa was still passing through his bad patch. He remained in bed, sleeping it off, for two days. When the Germans came. Grandpa was beyond any fear, but the rest of us, quite literally, shivered in our boots. A full lorry-load of Jerries spilled out at our gate at the crack of dawn. They bashed on the front door, nearly knocking Uncle Tadeusz down, and rampaging through the house like a torrent of hoodlums. With their rifles at the ready, they poked and probed at anything and everything. Presumably, having found nothing they were looking for, they departed, leaving everybody alive, thank the Lord, but the house in a dreadful mess. After the visitation we all felt like a drop of Mama's valerian. Borowa-Gora is swarming with Jerries. There are at least two soldiers for every villager. Their uniforms are greenish blue, and they are wearing black, knee-length boots. Some have helmets on their heads, others just forage caps, but all carry pistols hanging from their belts. The amazing part is that they feel quite at home in our village. They know exactly where to find food or water, how many men there are available for labour, and how many horses and carts there are at hand. They seem to know everything, though none, as far as I know, can speak Polish. Our German language is virtually nonexistent. Uncle Tadeusz has a smattering of it and Aunt Aniela finds it not too difficult to guess what they say, German being somewhat similar to English. Though Papa feels it's useful to know "nicht verstehen". So far, Herr Kommandant von Klein has only been wanting food, and he didn't ask for it, he just helped himself. Our cellar seems to have great fascination for Herr Kommandant.